If you follow the GAPS diet or Paleo lifestyle you know how hard it is to find boxed food products, especially carbs. You usually have to make everything from scratch. But when you do find them, you get so excited! One day, while walking at the grocery store, I stumbled upon Lentil pasta! I turned the box over to read the ingredients…. I was a little skeptical… And almost couldn’t believe when I read “Non-GMO Organic Red Lentils” and nothing else! I found something I could fix in 8-10 minutes and that my kids could eat! It was a dream come true! This product is the closest in taste to regular pasta we’ve ever been able to enjoy. It’s so hearty and easily complements so many dishes that we love. 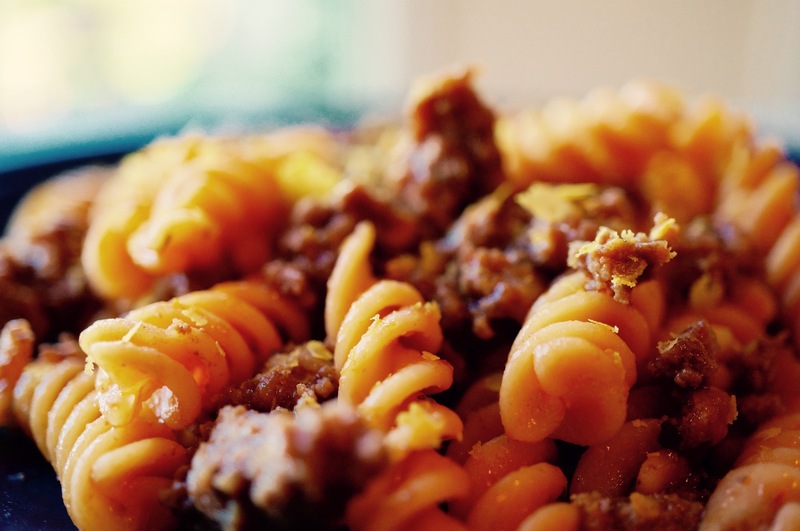 And who doesn’t love Pasta Bolognese? For my recipe of Paleo Pasta Bolognese I used Tolerant Organic Red Lentil Rotini. This company also has penne pasta among other great products. This is definitely one of our favorite food products out there! This is a meal made in 30 minutes! Super, practical, easy and delicious for kids and picky eaters alike! In a medium sauce pan sauté garlic in ghee until golden. Add onions, and Italian seasoning and cook until onions are translucent. Add ground beef, salt, pepper and tomato paste and mix until well combined. Add chicken broth, cover the pan and let it cook on medium-low heat for 20 minutes. In the mean time cook lentil pasta as instructed in the package. Once cooked, drain and rinse. In a large sauce pan, heat the ghee. Add pasta and garlic salt, sautéing for a couple minutes. In a plate, add pasta and top with bolognese sauce. Sprinkle nutritional yeast to taste and serve!